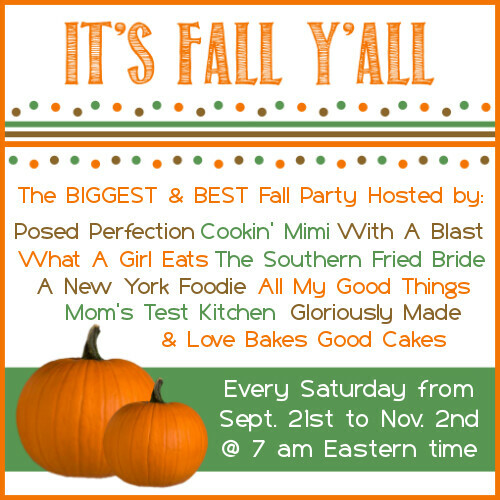 Welcome to It’s Fall Y’all – the BIGGEST & BEST Fall party! This year, we have 10 fun hosts – meaning your link-ups will show up on 10 different blogs! Let’s meet the hosts, shall we? This party is for all of your Fall related projects, recipes, crafts, decorating tips, tablescapes, DIY, printables, costumes, Halloween stuff, Thanksgiving stuff, etc …. By the way, they don’t even have to be new posts – share your stuff from previous years as well and let’s get them recirculated in bloggyland! Everything and anything Fall is welcome! We also have a Pinterest board for this party – Everything that gets linked up will get pinned for even more exposure!